. Brigid the Saint .
. Brigid the Goddess . The stories of two women named Brigid (or Brigit, Brighid, Bride, Brigedd or Bridget) appear to be inter­twined in an intricate Celtic knot of myths and miracles. Both a pagan goddess and a Christian saint of that name have person­ified essential spiritual values of their eras. Many of the fantastic miracles attributed to the saint relate to agriculture, the arts, and fertility — the same realms of which the goddess was patroness. St. Brigid reputedly tamed wild animals and mirac­u­lously gave a young man the ability to play the harp perfectly the first time he picked up the instrument. Her larder’s supply of food never ran out, and once a small cup of malt from her scullery yielded enough ale to supply all of the abbeys and monas­teries under her rule. As Christianity spread through the Celtic lands, certain properties of the older religion were incor­po­rated, rather than elimi­nated, and this was probably true of the Brigids. However, enough is known about the saint for her existence to be verified, though mostly legendary. Saint Brigid of Ireland (known also as Mary of the Gael) was born in Faughart around 450. According to tradition, her pagan father, Dubhtach, was of royal blood and her mother, Brocseach, was his Christian slave. Brigid was blessed with beauty, intel­li­gence, high spirits and a kind heart. She could not bear to see anyone hungry or suffering. She was in charge of her father’s dairy and, despite the fact that she often gave away much of its produce, the dairy prospered (hence her patronage of dairy and poultry workers). When her father tried to give her in marriage, she demurred. Because of her piety she was allowed to leave her father and become a nun, eventually estab­lishing the double monastery of Kildare, for both monks and nuns. There she not only became a patroness of students, she also founded a school of art, including metal work and illumi­nated manuscripts, over which St. Conleth presided. This connection and the instal­lation of a bell that lasted over 1000 years appar­ently led to her patronage of black­smiths and related fields. Her duties as abbess caused her to be a great traveler, which led to her patronage of travelers, fugitives, mariners and sailors. “Kildare” means “Church of the Oak” where many believe was a sacred flame which continued to burn for centuries into the Christian era. Her day, February 1, is regarded as the true First Day of Spring. It also marks the beginning of Imbolc, the Celtic Season of Light, when bonfires burned in honor of Brigid the goddess, symbol­izing purifi­cation after being confined to one’s home during the long bleak winter. It is also the festival of calving. 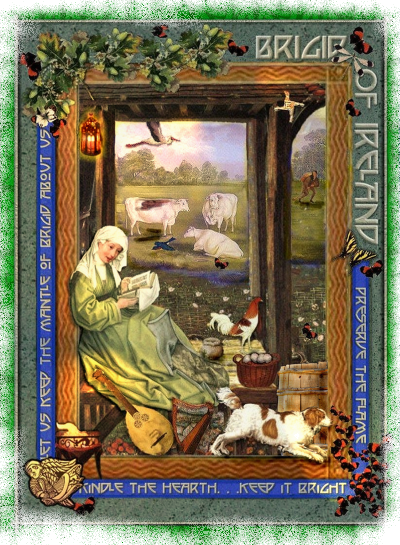 Brigid of Ireland is held in high regard in numerous countries. . .England, Scotland, Wales, Alsace, Flanders, Portugal . . .with many places bearing her name, and various tradi­tions celebrating her day. One legend gives Brigid credit for the custom of women being able to propose to men on leap year. Apparently she complained to St. Patrick about men always getting to take the initiative and persuaded him to at least grant women the privilege once every four years! A tradition holds on the eve of St. Brigid’s Day (Candlemas) when rushes or straw are woven into “St. Brigid’s Crosses.” Varying in materials and design from county to county, some are very elaborate and have become museum pieces. Others are simpler — just three or four points with a square or triangle in the center. They are hung in doorways to bring protection to the family. Visit our Connections page to learn much more, including a video of how to make a Brigid’s Cross. Love the new Astrology and Lunar aspects that are now part of the webpage. Ephemeris. . . . . . . This function has been disabled for Brigid of Ireland.